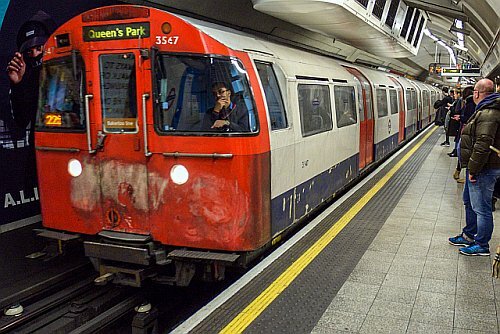 The Bakerloo Line’s trains are dreadful! In recent years the seats on the line were such a source of consternation so many people complained. 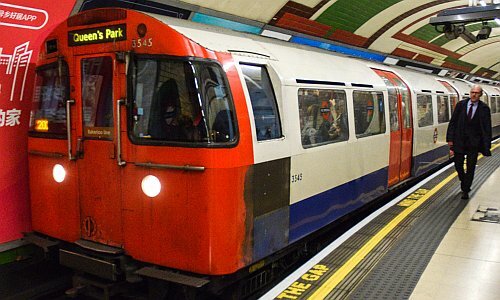 For a while they seemed nice and clean but no worries what goes up must come down for the Bakerloo once again has scruffy trains! This time its the outside of the trains. 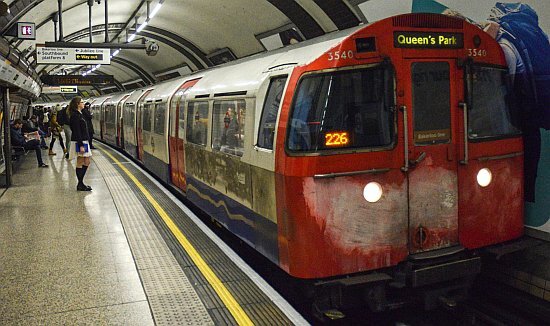 It seems around half the Bakerloo Line’s fleet are running in daily service looking somewhat worse for the wear. 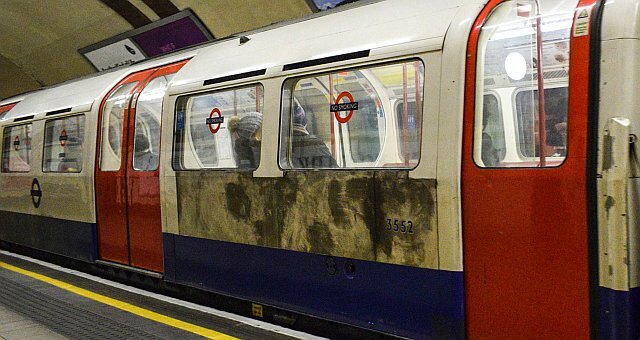 The cause of this current state of tardiness might be vandalism, or some form of obtuse coachwork which TfL simply hasnt got the resources to repaint. This has been an acute problem for the past year or so. At first I took little notice as it was just a handful of trains. 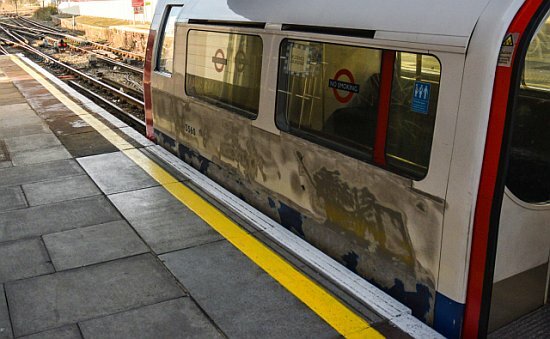 The trains affected almost invariably have their north facing end driving car damaged at the front or on the west side of the carriage (although a couple do have this damage too on the east side) The number of affected trains has increased enormously over the past year and the unsightly tarnished sides of the train are now occurring further along the carriages. I had thought this must be occurring to only those trains stabled overnight at London Road because of the high incidence of panels at one end of the trains. I could be wrong on this. There are older news reports that break-ins at this particular depot were occurring almost ever other night. Yet the spread seems to indicate the problem must be happening at more than one location. That’s five different sites in total. The other problem is I am not sure how the trains are acquiring very dark panels. Is it the treatment that is being administered? 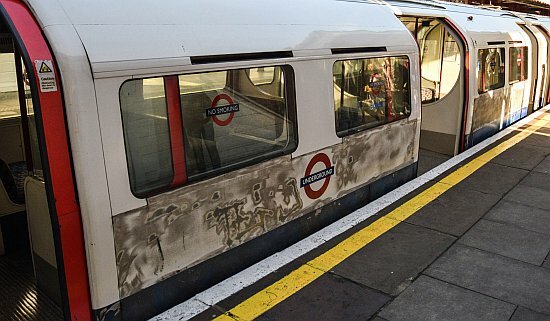 Or is it an attempt to blot out unsightly damage to the trains? Again I couldn’t say however it results in some of the trains looking quite dreadful. 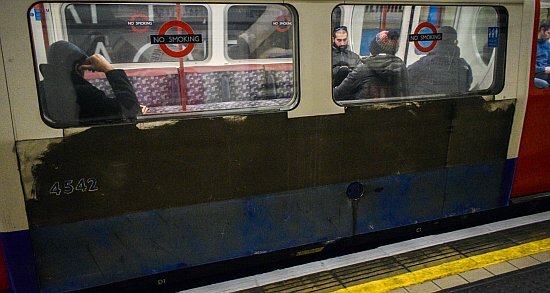 I have noticed a very small number of Jubilee Line trains similarly affected on the north end (eg Stanmore) driving cab. The result is the same although most would not notice. 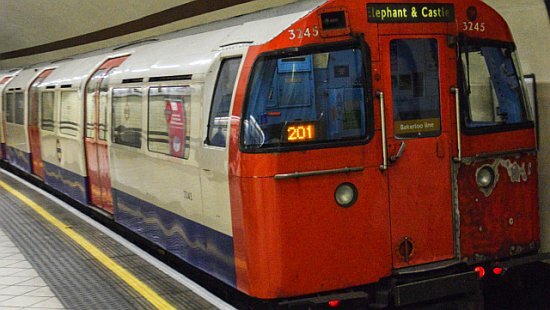 Initially it was assumed London Road was the contention (it has been known break-ins at that depot have previously occurred on an almost nightly basis) but it seems to be every stabling point on the Bakerloo except quite possibly the Elephant. The problem certainly had been apparent in 2016 as I discovered from my archives. From about April 2017 it has got much worse. I couldn’t help noticing the increase in numbers of these scruffy trains in service and so set about recording them. Increased security and better fencing at all the underground’s train depots has reduced the problem to a great extent yet even with this enhanced security there are some hot spots, and malicious attempst are made upon trains. Even preserved railways right out in the countryside have been affected badly – the Severn Valley very recently. 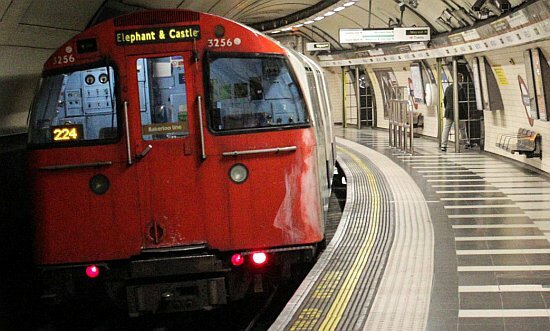 Some locations on the underground are almost guaranteed to procure vandalised trains. For example trains stabled at South Harrow sidings rarely leave those particular sidings in a pristine state. However I would think anywhere is affected especially as some have real determination to enter rail or tube depots regardless of the consequences. 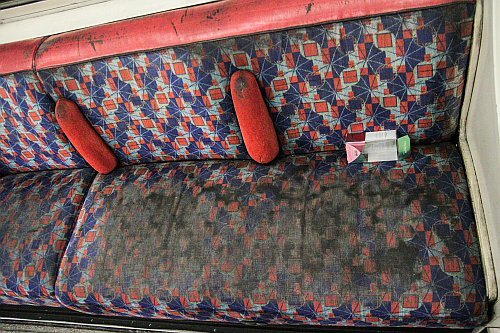 It seems to me the Bakerloo is getting it quite bad – I have photographs of examples on other tube lines – however it must be stressed the ugly appearances that can found on the Bakerloo’s trains is just not to be seen on any other tube lines. 3540 heading north at Embankment Feb 2018. One side of the problem…. 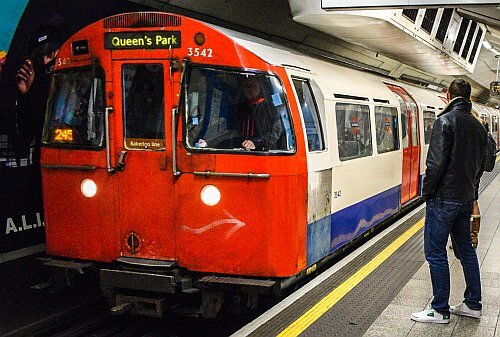 I’m concerned that leaving these Bakerloo Line trains in the very state they are being observed does not help. Certainly if they had been spotted for a day or two like this and then treated properly, it would show the authorities were tackling the situation. Yet many are being left in such a state for weeks, months even, and its not a very good statement. 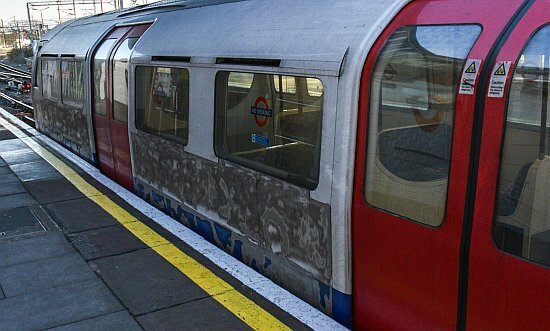 Its also a good advertisement for those who have done, and wish to do, further damage to London’s valuable tube trains.